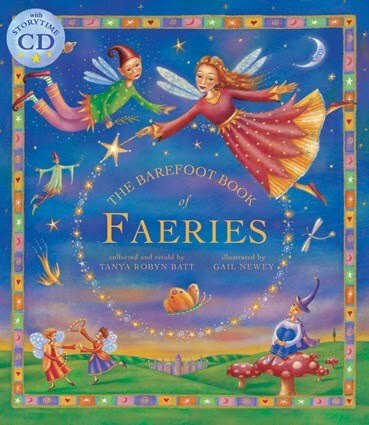 A Child's Book of Faeries is a series of stories and poems which have been "collected and retold" by Tonya Robyn Batt. As she explains in her introduction, "[t]he magical realm of Fair Elf Land has frequently captured the imagination of writers, artists and musicians alike." In this book she fosters that imagination in young readers by providing a variety of poems, explanations as to fairy behavior, temperaments, likes and dislikes and, of course, through the telling of stories. Apart from the fact that this book does contain the magic which faeries are naturally wrapped up in, I found nothing objectionable within that would need to be reported. (And I think if you start talking about faeries you are implying magic will be involved.) The stories are not scary at all but rather spark the imagination into wondering what it would be like if faeries really existed - or DO exist. And I know even begging the question would be insulting to some! At any rate, it's a fun and fanciful read. One of my favorite memories of going to Prince Edward Island is of the night my friends and I stayed at the West Point Lighthouse Bed & Breakfast. I purposed to wake up to see the sunrise on the beach and walk along the "Faerie Path" that was located behind the lighthouse. None of my friends could be convinced to rise at the crack of dawn so I went alone out onto the beach and walked along. Then I entered into the forest and had a delightful morning walk underneath the trees. It was a peaceful, chilly morning. I could hear the waves crashing in the distance and heard the wind and nothing else. It was secluded, safe, and magical. (Of course I was safe! Faeries prefer the nighttime and wouldn't be found during the daylight hours!) It's just such a peaceful moment and memory that I have locked away and I like thinking of faeries existing and being merry in green forests and sitting on mushrooms. It's just....fun! Happy to add this book to my collection to share with my daughter one of these days. If you are looking for a calm introduction to the world of faeries, I think you might like this one! Looks like an adorable book!. I recently hosted a Fairy birthday party where I had 10 little girls building fairy houses. It was amazing. I have recently discovered Barefoot Books and love their selection. We might have to add this one to our collection. I'll have to get one for Z! We haven't gotten into fairies much around here. Maybe I should look for this book at the library. The cover is just gorgeous on this one! I'm an L.M. Montgomery fan as well and Prince Edward Island holds a special place in my heart.